Following a surge in requests from tilers and contractors, BAL have relaunched their intensive five day wall and floor tiling course. Held at BAL’s state-of-the-art Innovation and Technology Centre (ITC), the course combines modern training techniques including presentation, workshops, demonstrations as well as “hands on” practical work in individual bays designed to reflect real life installations. Dave Rowley, BAL Training Manager, said: “At BAL we believe that quality workmanship is just as important as high quality products, which is why tiling training is top of our agenda. “Our five day wall and floor tiling was always a popular course so following a number of requests specifically tilers and tiling contractors we have decided to relaunch and bring this course up-to-date with modern standards, products and techniques. The five day course provides delegates with the skills and knowledge to use and mix professional adhesives and grouts onto realistic backgrounds. 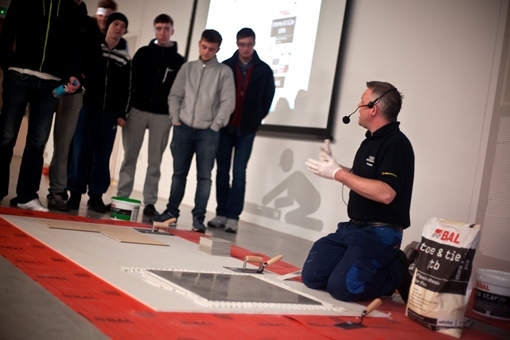 Delegates with develop a full understanding of floor and wall backgrounds, identification and preparation and practice in the use of setting out, tile fixing, tile cutting, cutting tools, and tile trims. Throughout the five days they will also develop an appreciation of the application and use of all types of adhesives and grouts, including epoxies and movement joints, both profile and sealants. Delegates will practice mixing, spreading, appropriate tool use, types and specifications. The five day course costs £300 and is being held on dates throughout the year. As well as practical training, the course also includes a tour of BAL’s world-class manufacturing facilities, R&D and Quality Control laboratories. On completion of the course, delegates will receive a BAL Certificate of Attendance, literature and BAL product worth more than the cost of the course at average trade prices. BAL training courses are endorsed by The Tile Association (TTA) and the Construction Industry Training Board (CITB) and have been highly commended by the National Training Association (NTA).